Travel 2017. Day 3. Argoños Wednesday, September 27/17. Run by two sisters, the Posada El Trasmerano is low-keyed and off the beaten tourist track. However, nearby there are several beautiful beaches and a salt-marsh nature reserve on a bird migration route (Parque natural de las marismas de Santoña y Noja). The old fishing port of Santoña –located within the park– is now popular with the sailing community and with Spaniards on a summer holiday retreat from the sweltering heat of the interior. We got up refreshed and enjoyed a tasty breakfast with freshly pressed orange juice, potato tortilla/omelette –a favourite offering for breakfast— homemade bread or toast, fruit, biscuits and tea or fresh coffee. After breakfast, we opted for a trip inland. One of the pleasures of the northern regions is the numerous valleys formed by rivers cutting through the mountain ranges. We didn’t want to overdo it the first day, so following recommendations we headed for a morning ride towards the small town of Solórzano on the River Campiazo. It was a good choice. 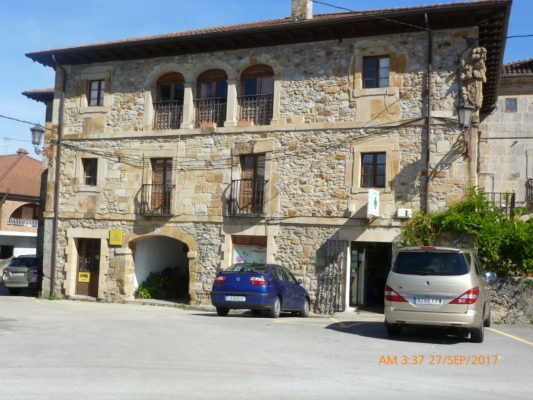 From Argoños, we passed quickly along the edge of the salt-marsh reserve, touched on the A8 highway, and then started up the valley of the Campiazo. 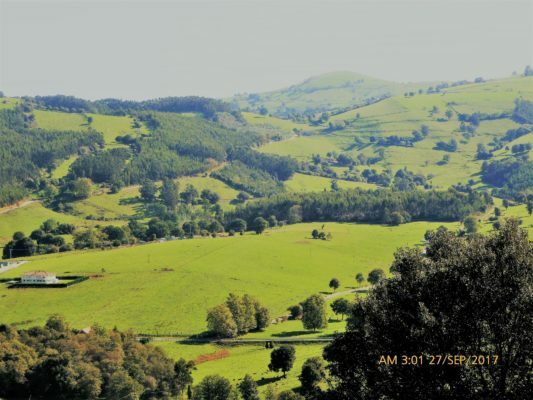 We’d forgotten how green and beautiful the north of Spain is, and the valley here was wide with small villages, farmhouses dotting the landscape, fields divided by hedgerows, and gentle, sloping hills some partially covered by trees. Having been brought up in the countryside ourselves, this rural landscape appealed to us very much. A quick call back at our posada, and we were off to the village of Isla for lunch following the recommendation of one of the sisters at the posada. 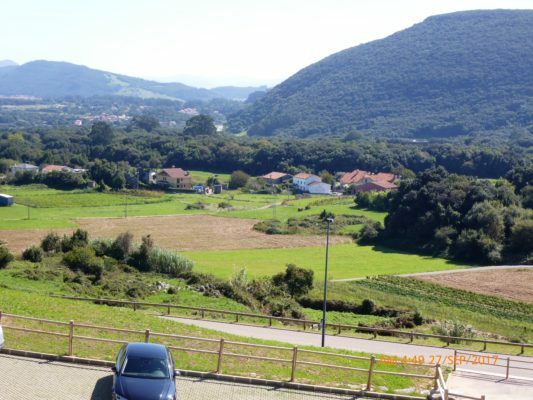 The road was picturesque and there was a scenic view from the village towards Santoña: a combination of trees, farms and wooded hills. View from Isla towards Santona. 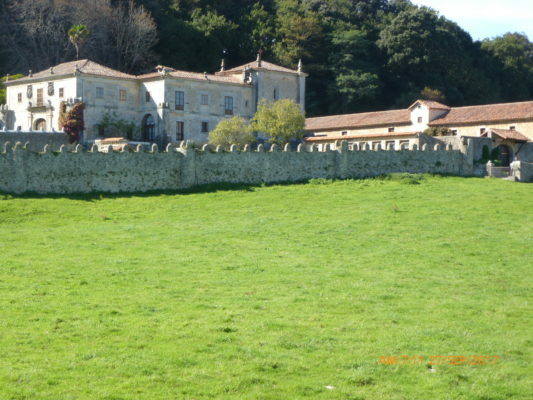 Outside the village, we came cross 2 striking casonas, manor houses. The first was an imposing, stately stone building, surrounded by a stone wall with fields in front of it and trees behind. The second was of cream-coloured stone located along the road. Both had heraldic shields alluding to some historic significance attached to the house. Similar buildings with heraldic shields are not uncommon in the north. There are two possible sources for these heraldic emblems. 1. They might indicate the nobility of the individual who ordered their construction, and point to a past when “to be from the mountains” of the north (ser de las montañas), was a sign of pride in one’s purity of blood. The reason for this? It goes back to when the Moors (Muslims) invaded the peninsula across the Straits of Gibraltar in 711. Many Christians fled to the mountainous northern fringe of the country, which became their centre of resistance. Therefore, the understanding was that the inhabitants of the mountains were Christians with pure, uncontaminated blood. The 16th century was obsessed with purity of blood because it was a distinguishing feature between “old” Christians and “new” Christians, that is, Muslim and Jewish converts to Christianity. To claim to be “from the mountains” was, then, understood to be noble and racially pure. 2. Many Spaniards who enriched themselves in Latin America (Las Indias), upon returning to Spain, often built mansions as indicators of their wealth and status, even to the point of adding shields to their buildings. We took a photo of each casona on the way back from Isla. You can just make out two heraldic shields above the main entrance (to the left of the photo) in the first manor. Beautiful roadside casona near Isla. Back in Argoños, we decided to do some laundry. We did not expect this to be easy, given the shortage of laundromats experience we experienced on our 2103 trip. 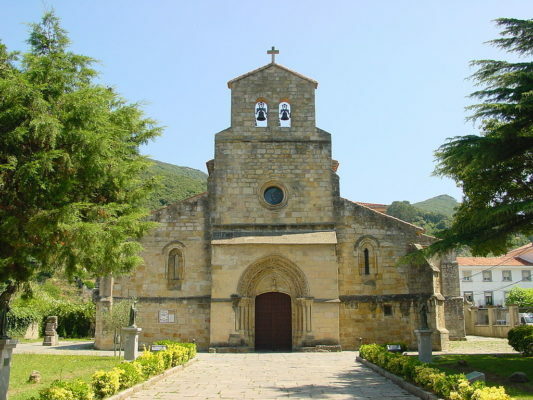 To our surprise, there was a laundromat in Santoña opposite the pretty 13th-century Romanesque (with later Gothic alterations) church of Santa María del Puerto. Church of Santa María del Puerto. The facility was very new and spotless, with two coin operated washing machines and two dryers. The washing was made easy with powder added automatically, thus avoiding purchasing it separately. The total cost for washing and drying was 11 euros.